Every home and office wants to be cleaned regularly and taken care of. Cleaners Streatham Ltd. is a professional cleaning company, which has been working hard for a long time to provide customers in London with a variety of cleaning services. Prices are super affordable and don't affect the budget. The company has trained a team of devoted cleaners, who can perform professionally and effectively, showing incredible results and pleasing your demands. The detergents that are used are environmentally-friendly and harmless to the health. The web server with the IP-address 5.77.46.33 used by Cleanersstreatham.net is run by EUKHOST Ltd and is located in Great Britain. This web server runs a few other websites, mostly in the english language. 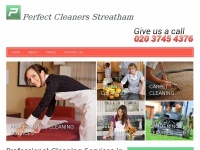 The websites of Cleanersstreatham.net are served by a Apache server. The content management system WordPress in the version 4.7.1 is used. The HTML pages were created with the latest standard HTML 5. The website does not specify details about the inclusion of its content in search engines. For this reason the content will be included by search engines.